MOU signed with "Sage Informatics Pvt. Ltd."
10 TON PLANT RUNNING SUCCESSFULLY IN A.P. 5th plant in Andhra Pradesh with 10-TPD capacity installed and running successfully in Miyapur, Hyderabad. 5th plant in Maharashtra with 10-TPD capacity installed and running successfully in Navapur, Maharashtra. Divya International keep focusing in quality and best after sales service, by this ethic divya international spred his wings to all over the india. the most advance 10 Ton waste TYRE Pyrolysis Plant seting up in Madhya Pradesh. The plant is running successfully. Divya International keep focusing in quality and best after sales service, by this ethic divya international spred his wings to all over the india. 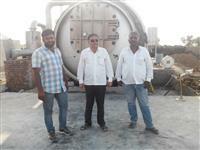 the most advance 10 Ton waste TYRE Pyrolysis Plant seting up in Andra Pradesh. The plant is running successfully. Divya International keep focusing in quality and best after sales service, by this ethic divya international spred his wings to all over the india. 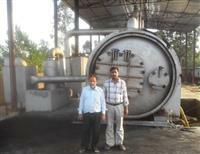 the most advance 10 Ton waste TYRE Pyrolysis Plant seting up in ASSAM. The plant is running successfully. Divya International provides pyrolysis process solution on turnkey basis and recently installed plant in Abu road in Oct- 2013 and it is running successfully. Divya International keep focusing in quality and best after sales service, by this ethic divya international spred his wings to all over the india. 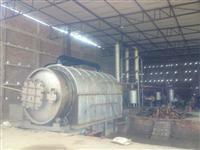 the most advance 10 Ton waste TYRE Pyrolysis Plant seting up in AASAM. Divya International keep focusing in quality and best after sales service, by this ethic divya international spred his wings to all over the india. 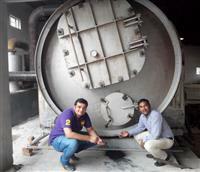 the most advance 10 Ton waste TYRE Pyrolysis Plant seting up in aburoad. Our relentless commitment towards our customer we have installed 10 tons tyre recycling pyrolysis plant at Mathura distt. (U.P) through the reference of our existing client. Divya International keep focusing in quality and best after sales service, by this ethic divya international spred his wings to all over the india. 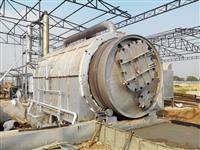 the most advance 10 Ton waste Recycling Pyrolysis Plant set up in Patna ( Bihar). this plant running smoothly. 4th plant in Maharashtra of 5-TPD capacity is going to installed in Gondia (Nagpur), Maharashtra. 10-ton capacity plant is going to installed in Prakasam, Andhra Pradesh with many advance features & facilities including in it. "Confidence comes from discipline and training." As per our Hisar client's quote "Quality pyrolysis machinery is the one part of Divya's success, the other part is the what knowledge & training they inculcate during the operator training sessions & after sales support which they provide. This helped me to generate confidence in pyrolysis field." With this confidence our Hisar client has installed his 2nd plant of 5-TPD in Haryana. "Quality is never an accident"; it is always the result of high intention, sincere effort, intelligent direction and skillful execution; it represents the wise choice of many alternatives. Our quality focused approach has got us our 8 repeat order dispatch for Rajasthan, Bicchiwara. Two 5-TPD capacity plant is going to install parallelly. "Quality is not an act, it is a habit." That's what we are upto. Our constant zest to provide our clients with quality tyre pyrolysis machinery has made possible to install our 8th plant in Haryana (& still counting more). 3rd plant in Maharashtra of 12-TPD capacity is going to installed in Wada (Thane), Mumbai. 5-ton capacity plant is going to installed in Rajasthan Ajmer. 2nd plant in south & Tamil of 12-TPD capacity is going to installed in Tamil Nadu, Theni with advance roller system & reactor cooling system. Finally our 1st plant in south of 10-TPD capacity is going to installed in Tamil Nadu, Chennai. Providing quality & service has been essence of Divya International since it's ineption & these quality of our's has build up the trust in our clients in Haryana. Because of this we are going to install our 6th plant in Haryana from total 25 plants installed across all over India. "Quality speaks louder than words" that's what we are proving true. Repeat orders continues, our first client in Jind, has given the repeat order of 5-TPD capacity plant which is going to installed in Rohtak, Haryana. 10-ton capacity plant is going to installed in Rajasthan Bichhiwara with many advance features & facilities including in it. Divya International has given authorized franchisee to Sage Informatics Pvt. Ltd for the territory of Southern Africa region which include the following countries- South Africa, Lesotho, Botswana, Malawi, Swaziland, Zambia, Zimbabwe, Madagascar, Mauritius, Angola, Nambia, Republic of Congo, Mozambique & Seychelles. Our uncompromising quality standards, unparalleled services and individual attention have helped us to achieve our corporate objective of total customer satisfaction & by installing second 5-TPD capacity machinery of the same client in Sonepat within 6 months resembles that. Plant setup in June 2012. Our second plant install in Maharashtra, Kolhapur. Plant setup in May 2012. Services what we provide to our client gives us the business. Our 5-ton machinery install in Rajasthan, Bichhiwada. Plant setup in May 2012. Our 3rd machinery installed in Chattisgarh, Billaspur. Plant set-up in April 2012. Our uncompromising quality standards, unparalleled services and individual attention have helped us to achieve our corporate objective of total customer satisfaction & by installing second 5-TPD capacity machinery of the same client in Durg within 6 months resembles that. Plant setup in April 2012. Our 3rd plant installed in Haryana, Hisar. Plant set-up in March 2012. Our first plant in Maharashtra, Jalgoan. Plant setup in Feb 2012. Our relentless commitment towards our customer we have installed 12 tons machine at Jaipur, Rajasthan in Feb 2012 through the reference of our existing client. Our team has given the breakthrough in the pyrolysis field in India by designing & installing two 12-tons Plants parallely in Indore in Jan 2012. A start of year with a bang. At the end of the year 2011 we have installed our 8th machine at Sonepat, Haryana in Dec 2011. Installation of 5 TPD in Gujarat in Oct 2011. Our team continues to deliver quality & services which our customer need. With this we had installed our 1st project in Chattisgarh at Durg in Sept 2011.